Bos Wars is a futuristic real time strategy game (RTS). In a RTS game, the player has to combat his enemies while developing his war economy. Everything runs in real-time, as opposed to turn-based games where the player always has to wait for his turn. The trick is to balance the effort put into building his economy and building an army to defend and attack the enemies. Bos Wars has a dynamic rate based economy. Energy is produced by power plants and magma gets pumped from hot spots. Buildings and mobile units are also built at a continuous rate. Control of larger parts of the map creates the potential to increase your economy throughput. Holding key points like roads and passages allow for different strategies. It is possible to play against human opponents over LAN, internet, or against the computer. 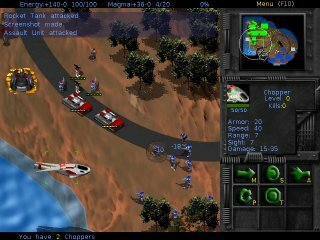 Bos Wars successfully runs under Linux, MS Windows, BSD, and Mac OS X.
Bos Wars aims to create a completely original and fun open source RTS game. Bos Wars is copyrighted in 2004-2018 by Tina Petersen Jensen, François Beerten et al. See COPYRIGHT.txt in the package for the full copyright notice. The project is kindly hosted by Seul and Savannah. Please report bugs in the Bug Tracker. You can also talk with the Bos Wars team on irc in the #bos channel hosted by freenode.